I see that Professor Campos is finished with his effort to expose the Law School Scam. I read his blog once or twice but felt like I knew and agreed with most of what he was saying so I did not keep up. Judging by some of his enemies, how wrong could he be? Frankly, I am pretty much out of gas on my far more modest Classbias blog too. It has always had a goal that was a bit different than that of Professor Campos. Its goal was to reveal the persistent and destructive effects of institutions run by elites for their own ends. Here is one more effort to explain the problem. The people I know can be placed along a continuum. At one end are the "demanders." These are the folks who feel entitled to virtually everything and "demand" that their desires be met. Slipping along the continuum we come to the "askers." What ever they can think of, they ask for. At the far end are the people who do not demand or ask. If you know anything about relative deprivation, you know that to demand or ask you have to be in a context in which things are perceived as possible for people like you. For example, I remember a few years ago when two new faculty hires were told they would be given a certain sum for moving expenses. The reaction of one way, "What? They will actually pay for me to move. What a great surprise." The reaction of the other was "I cannot possible move for such a small amount." The important thing to note is that there is no correlation between need, merit, productivity, student welfare or institutional success and a person's position on that continuum. In addition, administrators say yes to these requests and demands for a host of reasons other than student or institutional welfare. For example, an administrator may say yes just to avoid the harassment or to make sure he or she is not accused of 'insensitivity" to one political group or another. Or, the administrator may be concerned that the asker/demander is capable influencing others to believe he or she has been unreasonable. Here is my best try at using Venn diagrams to illustrate the problem. The larger two circles are things people ask for or demand and reasons administrators say yes. 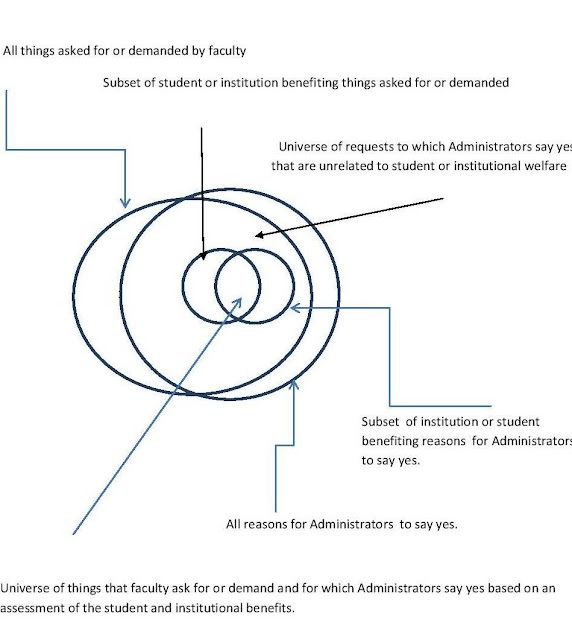 The smaller circles within each one show things asked for or demanded that are consistent with student or institutional welfare and the times administrators say yes for reasons related to student or institutional welfare. That tiny overlap in the middle shows how much these interest coincide. A much larger area indicates when requests and demands that have nothing to do with student or institutional welfare get a yes answer.